As we know all too well, British summertime doesn’t mean glorious sunshine every day. However, on those days when the sun does peek through the clouds, there are some excellent ways to ensure you’re making the most of your garden. If you invest some time and money into your garden, you can make it a real haven. Spending time in your garden can actually have multiple health benefits, as well as being a great place to relax. Whether you add some garden paving, invest in furniture or indulge in a luxury hot tub, transform your garden this summer! No matter what size your garden is, there are definitely a few ways to make your outdoor space stand out from the crowd and be an enjoyable place to spend time. We’ve certainly not got the biggest garden but nevertheless, it’s one of my favourite things about our home – mostly because of the layout. It’s far from finished, as you can see from the unstained fencing and the scrap wood in the corner of the yard… but we’ve put in a few hours recently to get it ready for summer, as we’ve started eating dinner in the garden and having friends over. If you have a small budget or a small garden, one of the most simple and effective ways to spruce it up is to add some garden furniture. Tables and chairs are essential if you plan on hosting barbecues and eating outside. Even a simple bench can make a difference and be ideal for reading in the garden. We’ve recently bought a 4 seater sofa set from Argos (although we’ve only got as far as to put together the chair, table and sofa!). We couldn’t wait to get out on the deck and enjoy a little glass of wine in the sunshine. A sure-fire way to make your garden that little bit more magical is to add some outdoor lighting. There are hundreds of different kinds of garden lighting to choose from, which means you can certainly find something to fit your style and taste. Lanterns, fairy lights, or even candles can all set the mood and create a wonderful atmosphere. We opted for a tabletop Biofire to keep up cosy in the evenings, and string bulb lights under the deck. If your garden needs a quick lift, adding some simple furnishings is the best way to do this. Subtle additions like plant pots with brightly coloured flowers can make a huge difference. Check which flowers bloom at different times of the year and place the pots around your garden. If you have garden furniture, adding cushions and throws is a great way to add some extra vibrance to the seating area. Picnic tableware, bunting, cushions and a colourful umbrella are also excellent ways to add an array of brightness. Buying decking or garden paving is great for ensuring that the garden table and chairs don’t sink into the grass or feel wobbly. Decking and garden paving can give a different vibe to a garden and can be stylised to suit your taste. 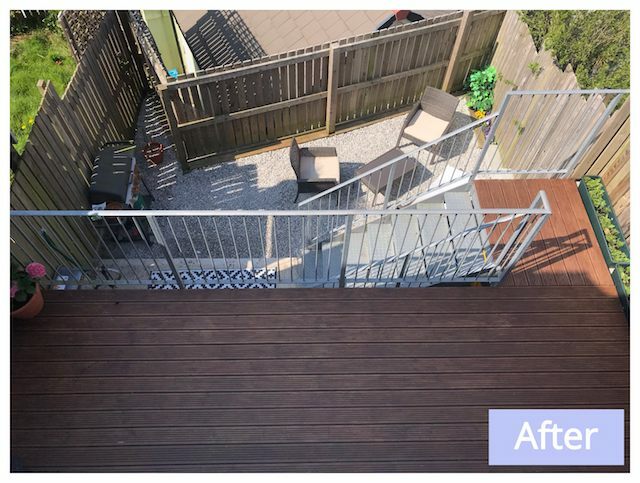 If you opt for decking, you’ll want to know how to look after it and keep it clean. This means pressure washing (which is immensely satisfying!!) it and giving it a coat of wood preservation to keep it looking sleek. I’m pretty proud of how this came out, all for the low-cost of just £16.99, thanks Ronseal! Garden paving comes in a variety of shapes and colours. No matter what design you want, you’ll likely to be able to find it. Sandstone paving is particularly popular, as it’s versatile and very durable to weight and weather. We have sandstone paving out the front of our property and after two years, it still looks brand new. If you’re unsure, you could mix it up and have both garden paving and decking for a distinctive and unique garden that’ll satisfy you and impress any garden party guests. This is a true piece of luxury for your garden. However, if you know that you’ll love relaxing in a hot tub and use it frequently, it’s 100% worthwhile. Hot tubs can vary a great deal in price, starting as little as a few hundred pounds and increasing to over £10,000, so some browsing is needed to find your best option. Until we knew exactly how much we were going to use our tub, we decided to opt for an 6 person inflatable Lay z Spa. Luckily, we came across an absolute steal (thanks to my lovely Mother-in-Law!). It’s so much fun for having friends over for drinks or just chilling after a long day and watching the sun go down. We’ve positioned it underneath our decking because this is space that we otherwise didn’t use (other than for storing our kayaks, which we’ve just shifted behind the tub!). It’s perfect because we can store speakers and drinks in the steel beams above, and hang lights from the decking. We’ve even made a little area for clothes, dressing gowns and phones opposite, so our stuff doesn’t get wet. If you’re thinking of getting a hot tub, ensure it’s fitted in a safe area, possibly on some durable garden paving. We bought some tile flooring to protect the tub. The foam not only protects the hot tub from punctures, but it also keeps the heat in, which keeps the energy bills down (phew!). Pallet seating and furniture is becoming increasingly popular, giving gardens a rustic and natural look that’s increasingly fashionable. If you prefer wood instead of plastic or metal outdoor seating, pallet seating and a table could be the way to go. You can get creative with colours and cushions and can scale the wood to fit the size of your garden. During the day, this is where I sit in work because it shaded and I can see my laptop screen. But by the evening, this is where we keep our towels whilst we enjoy the hot steamy bubbles (in this case, our puppa beat us to it!). Whatever you decide to do to your garden, turn it into a space you enjoy spending time in. Feeling comfortable and relaxed during the summer months will allow you to make the most of those fleeting summer days, watching the sun set in your favourite spot.